The Empire State Building is a 102-story skyscraper located in Midtown, Manhattan, New York City. Its name is derived from the nickname for New York, the Empire State. The Empire State Building is an American cultural icon, designed in the distinctive Art Deco style. It's been named as one of the Seven Wonders of the Modern World by the American Society of Civil Engineers. 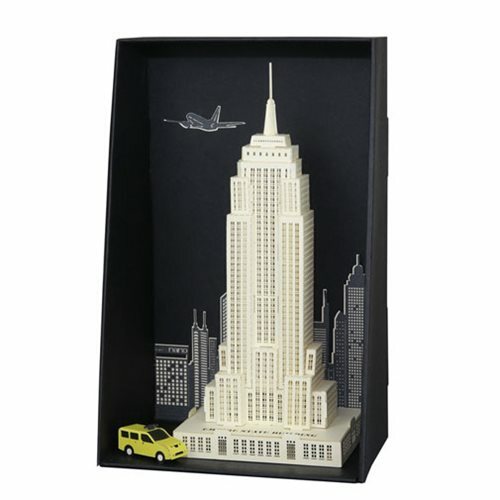 Take your papercrafting to the next level with this Empire State Building Paper Nano Model Kit! Laser-cutting technology allows you to build the world-famous structure in more detail than ever before, and it's the perfect display piece to show off your papercrafting skills! Detailed color instructions and a folded display case included. Ages 12 and up.